People generally love to gather 'round for whatever reasons. Nothing short of good food, especially during December, we use it as an excuse to indulge more than usual. 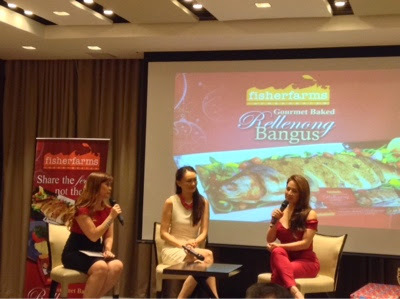 The world-class aquaculture food processor and largest supplier of farm-raised milkfish in the country, Fisher Farms came up with an healthy alternative to a classic dish: Gourmet Baked Rellenong Bangus. The whole bangus is stuffed with a savory filling of fish, sweet potato, bangus belly, shrimp and other premium and special ingredients. The raisins, as shared to me by one of the employees during a quick chat, is dipped in rum. Celebrity chef and food expert Reggie Aspiras' recipe produced a juicy and tasty version. By baking the fish, instead of frying, fat content is considerably cut down. It helps that our pambansang isda is naturally low in sodium and cholesterol, has omega-3 fatty acids, vitamins and minerals. Nanay doesn't cook as much as she used to anymore and traditional rellenong bangus takes time to prepare. This product is a lifesaver! Available in three generous sizes: 800g, 1.1kg and 1.3kg in select supermarkets in Metro Manila and in select provinces around the country. Also, our family got acquainted with other milkfish products such as the Bangus Lemon Butter, Fish Hungarian Sausage, All-Natural Fish Frankfurter, Fish Nuggets, Gourmet Selections Roasted Garlic and Smoked Deboned Milkfish. For more details/updates about Fisher Farms, visit fisherfarms.ph, Facebook, Twitter or Instagram.